Transport Minister Shane Ross has described claims that his battle to reform the judiciary is driven by a personal agenda as "absolute nonsense". Using parliamentary privilege earlier this week, senator and barrister Michael McDowell said he knew the background to Mr Ross's Judicial Appointments Bill. "It arises from his dissatisfaction with the way a particular case that he was involved in as a plaintiff was decided. I won't go further into it. "I know the details and I know what we are dealing with here. That is why he wants this particular provision to be put in place," Mr McDowell told the Seanad. He was warned by the chair of the session, Fianna Fáil Senator Diarmuid Wilson, that the minister was not there to defend himself. Mr McDowell later clarified he had incorrectly described Mr Ross as a plaintiff in the case he was referring to. Responding for the first time, Mr Ross has told the Irish Independent that the senator is "completely wrong". Mr Ross said he knew the case Mr McDowell was referring to, a libel action where he was a defendant in the 1990s. "First of all, he described me as the plaintiff in the case. I was not the plaintiff, I was the defendant. "I had a case around 25 years ago. I can't even remember the name of the judge or who was involved," the minister said. He added that the case, where he was sued due to an article in the 'Sunday Independent', "hasn't cost me a moment's thought since". "I was particularly aware long before that of the problems of selecting judges. That was absolutely nothing to do with it," Mr Ross said. He was personally sued as part of a libel action against him and Independent Newspapers by one of two inspectors who investigated matters at food company Greencore. The lawsuit arose from an article he wrote in 1992 criticising the level of fees paid to the inspectors, one of whom was senior counsel Ciaran Foley. The piece accused the inspectors of "ripping off the State". Mr Foley won his libel action in the Circuit Court in front of Judge Frank Spain in 1993 and was awarded Ir£30,000. An appeal to the High Court, heard by Mr Justice Hugh Geoghegan, upheld the circuit court decision. The judge found the article went well beyond strident criticism of the magnitude of the fees and quite clearly imputed immoral conduct on the part of the two inspectors. 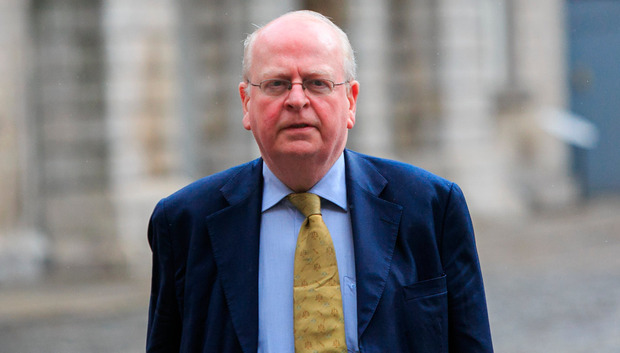 Mr Ross's controversial Judicial Appointments Bill is expected to finally pass through the Seanad next week. He said TDs and senators with legal backgrounds were "fighting a rearguard action because it disturbs their cosy way of life". "The opposition to the bill in the Seanad is from Ronan Mullen, Michael McDowell and Ivana Bacik. The opposition in the Dáil came from Jim O'Callaghan. They are all lawyers," Mr Ross said. "The Law Library is basically marshalling its forces as are the judges in sending Michael McDowell and others to represent them in the Seanad." Noting that some of the debate has been personal, he added: "I think it's a fairly cowardly way to address the issue, by attacking me. "I'm not being personal about this."